I love that I can see through the lid so that I know which primaries I'm taking with me and when I need to refill the wells. I only need six pigments, a warm and cool of each primary. I use the three little wells in the middle to keep my mixes clean. Thanks to the deep lid, I can paint sketches that require larger areas of a wash while still keeping three separate color mixes clean (in the little wells). The magnetic square on the bottom keeps the wells in place and allows for easy removal of each pan for cleaning and refilling. 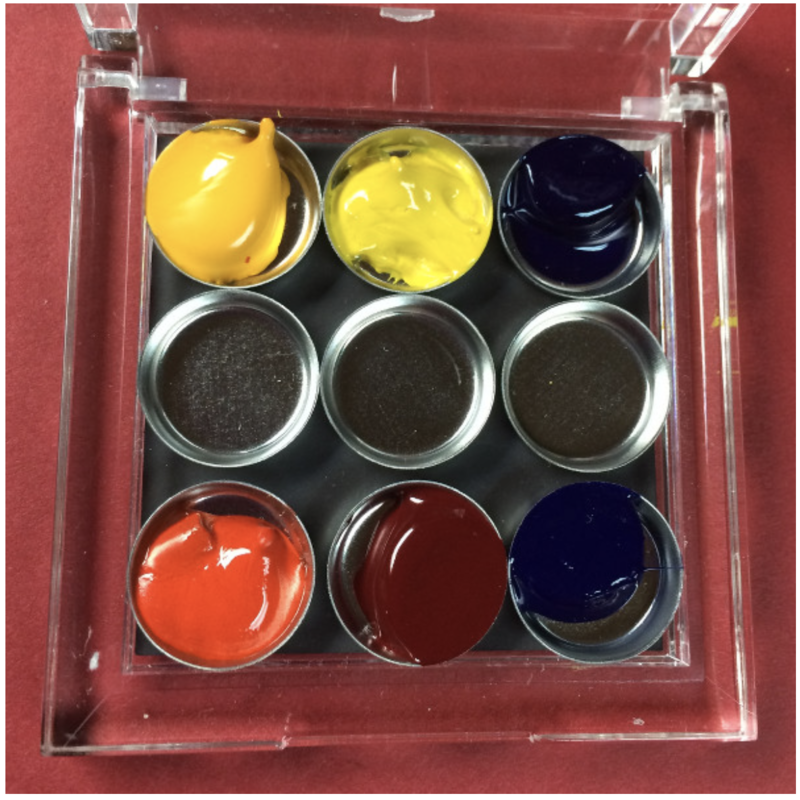 My standard six-pigment palette is Gamboge, Aureolin, Joe's Blue (phthalo), Ultramarine Blue, Permanent Alizarin Crimson and Cadmium Red Light. I arrange them (as shown above) as they would fall on the color wheel so that i don't confuse my blues and I won't get muddy violets by mistake. 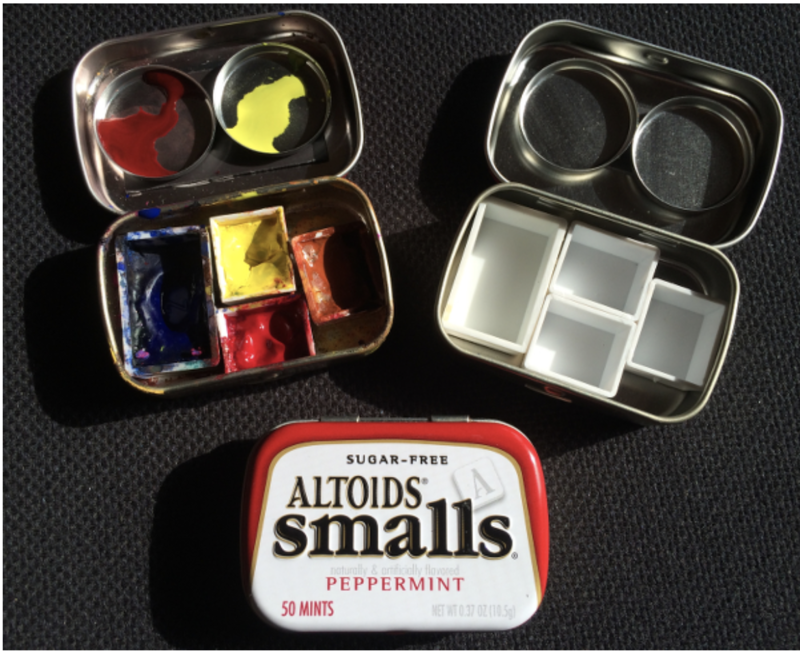 The two problems with my original design of the Mini Altoid Pocket Painter Palette was that it provided only one well for mixing pigments, making it difficult to keep my colors clean and expressive; and the plastic pans sometimes fell out. By placing a small magnetic strip on the lid I have added two round mixing wells that can stay attached when the lid closes. 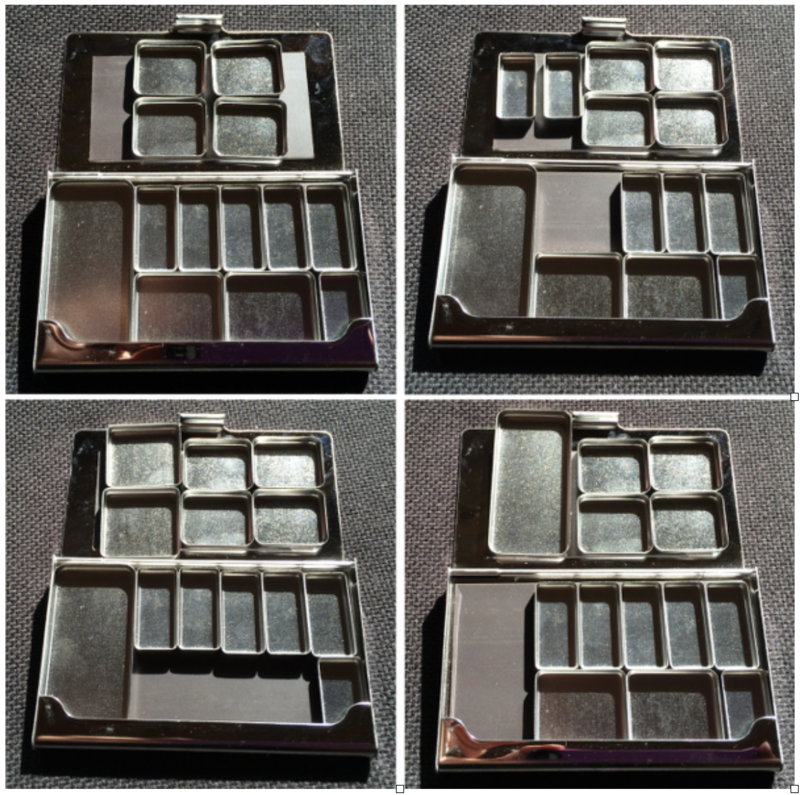 I glue small pieces of magnetic strips onto the bottom of the plastic pans to hold them securely to the tin bottom while also allowing for easy removal to clean or to change my choice of pigments. The plastic pans are deeper than the tin pans and I don't have to refill them as often. I like to have several mixing wells to keep my colors clean. I found that the flat lid of the business card holder doesn't work well for me as a mixing surface. 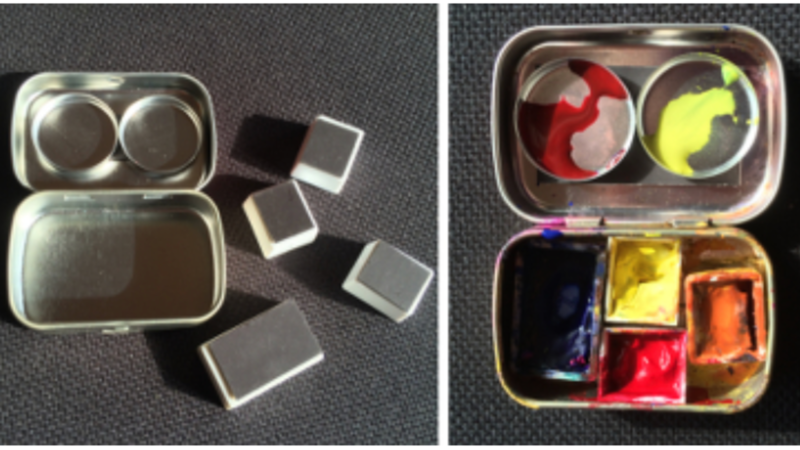 I have used different size tins within the holder so that I can mix larger washes. 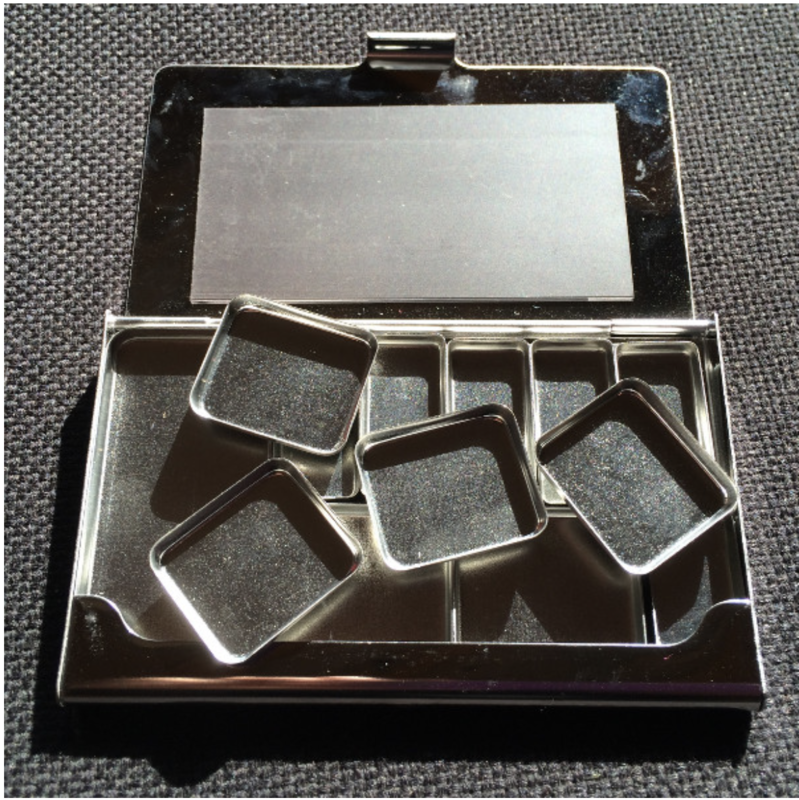 I tuck four extra tins into the tins I don't use for pigments (I only use six pigments). I've attached a second magnetic strip to the lid. The four extra tins attach to the lid while I'm painting. Exploring Color Schemes using a limited palette! Mixing and Mastering Gorgeous Color with a limited palette.